There will be a celebration of spring, plant sharing, and time for lessees to get to know each other. We also hope that folks will take this opportunity to mulch their pathways to minimize weed growth. Download the updated URI Planting Calendar. This table lists the planting time and days till harvest by vegetable and is a great resource. URI Hotline: ​The URI Gardening and Environmental Hotline is staffed by trained URI Master Gardeners to help you identify plants and troubleshoot problems in the garden. Snap a photo with your smartphone and send it to gardener@uri.edu, or call (401) 874-4836 to speak to someone directly. 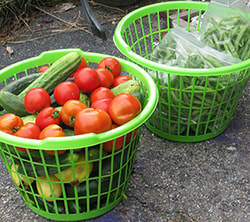 Left: One of the many donations that the Barrington Community Garden has made to TapIn, which serves East Bay residents in need. In 2018, we donated close to 300 pounds of food. 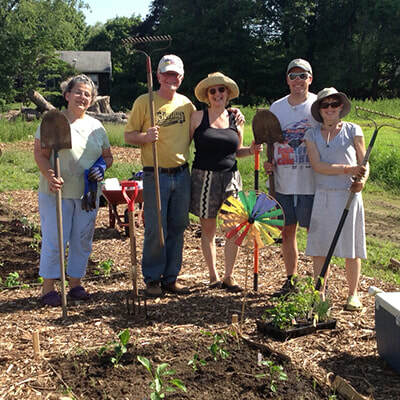 ​We take great pride in caring for our dedicated garden plots where we grow organic food that we distribute to those in need. A throwback picture from the first year, with no fencing to keep out the deer, no shed with tools, and having to haul our own water. You have our word! We will never, ever share your email with anyone or send you any marketing material. We only use the bulletin to let you know when the garden registration is open and to give you pertinent information about the Barrington Community Garden. And of course, you can unsubscribe at any time. Accessing the Barrington Community Garden from Wampanoag Trail, while direct, can be a bit tricky with merging traffic in the turn-around. We suggest you take a safer, alternate way. Download the alternate directions.